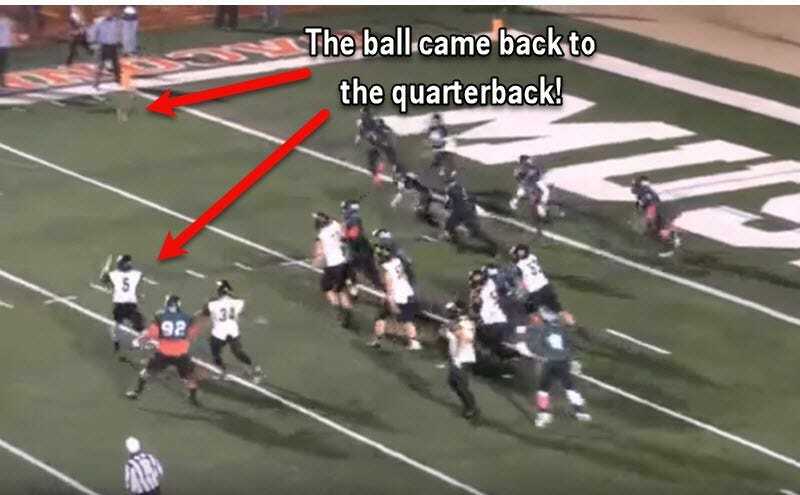 On Thursday night, an Oklahoma high school team won a game with a two-point conversion in the final seconds that included the quarterback completing a pass to himself, a lateral, and a defender helping a runner juke five other defenders. 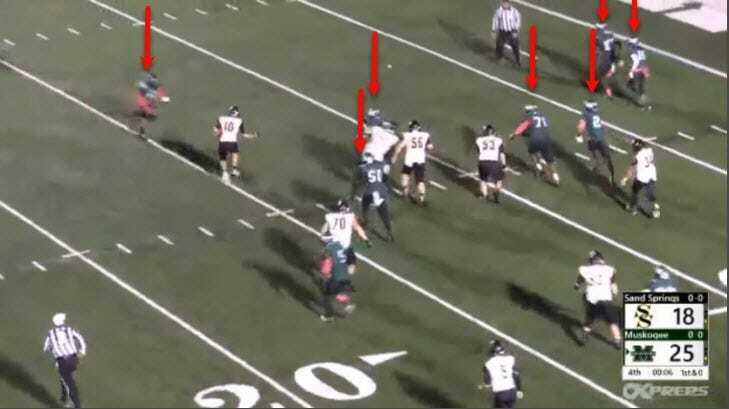 The wackiness started when Sans Springs (white jerseys) scored a touchdown with just six seconds to play, as detailed by NewsOK.com. That made the score 25-24 (ignore the score on the screen below, it had not been updated). Rather than go for a one-point conversion and force overtime, they elected to go for two and the win. Sand Springs quarterback Hunter Greathouse took the snap and tried to hit a wide receiver on a quick slant. However the ball was batted straight up into the air. Amazingly, the ball came back down to Greathouse, who was able to catch the ball despite being hit by a defender. At this point, Greathouse reverses field, runs back to the 25-yard line, and is heading towards the other side of the field. In all this confusion, it would be easy for any quarterback to forget that he can’t throw another pass. But Greathouse kept his cool, started to run upfield before running into a dead-end. At this point he lateraled the ball to a teammate. Wide receiver Josh Taber then took the ball and started to move back towards the middle of the field. Taber had about seven defenders he needed to beat, and not a lot of blocking help. The first hit comes from a defensive lineman. 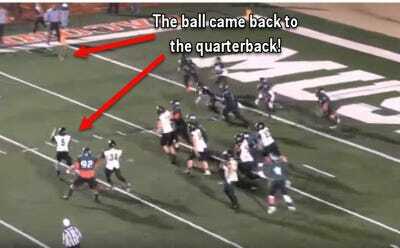 Amazingly, that helped propel Taber into the end zone for the winning score. Here is that hit again in slow motion. 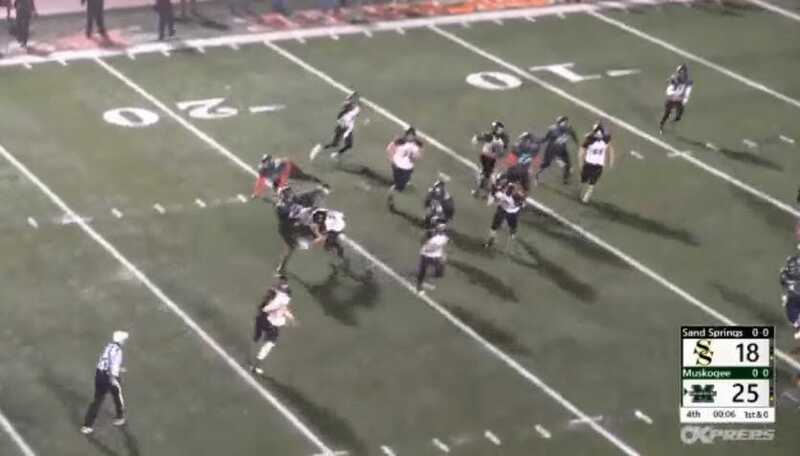 The hit from the defender actually caused Taber to juke five other defenders. Here is the full play.